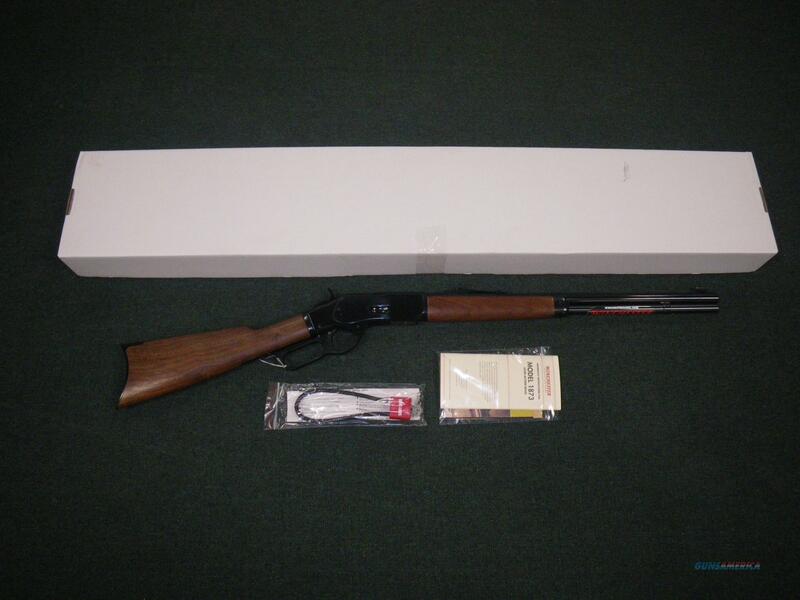 Description: You are bidding on a new Winchester Model 73 Short Rifle in 357-38 with a 20" barrel. The Model 1873 is widely credited as being “The Gun that Won the West.” This is a genuine Winchester Repeating Arms Model 73 with an oil-finished walnut stock, classic blued steel crescent buttplate and a 20" round barrel, just like the original. If you’re the type of collector or hunter who won’t settle for second best or a copy of a copy, fill your hands with this magnificent rifle, saddle up and blaze your trail into the sunset. The features are all there. Walnut straight grip stock with a satin oil finish that’s velvet smooth to the touch. Classic rifle style forearm with blued steel cap for the timeless look and feel of the original Model 73. Blued steel crescent buttplate slips into your shoulder for a solid hold. Round 20" barrel with full-length magazine. Semi-buckhorn rear sights with Marble Arms Gold Bead front sight gets you on target quickly. Steel loading gate for smoother loading. Receiver rear tang is drilled and tapped for optional tang-mounted rear sight for a more precise sight picture. Displayed images are stock photos. Any questions please feel free to ask (our phone number is in the additional information tab above).